What Clio Triggers and Actions are Supported? New Document - Triggers when a new document is created. New Communication - Triggers when a new communication is created. New Matter Note - Triggers when a new matter note is created. Task Status Updated - Triggers when the status of a task has changed. New Bill - Triggers when a new bill is created. New Calendar Entry - Triggers when a new calendar entry is created. Matter Status Updated - Triggers when the status of a matter has changed. New Matter - Triggers when a new matter is created. Bill State Updated - Triggers when the state of a bill has changed. New Activity - Triggers when a new activity is created. Create Matter Note - Creates a new matter note. Update Person Contact - Updates an existing person contact. Update Company Contact - Updates an existing company contact. Create Matter Folder - Creates a new folder in a matter. Create Communication - Creates a new communication. Update Matter - Update an existing matter. Assign Task Template List - Assign a Task Template List. Create Matter - Creates a new matter. Create Expense Entry (Activity) - Creates a new expense entry. Create Time Entry (Activity) - Creates a new time entry. Update Task - Updates a task. Create Company Contact - Creates a company contact. Create Person Contact - Creates a person contact. Create Calendar Entry - Creates a new calendar entry. Find Matter - Find a matter by display number, description, or client name. Find Company Contact - Find a Company Contact, by name, email or phone number. Find Person Contact - Find a person contact by first name, last name, email or phone number. When creating a new Zap, it’s easy to connect your Clio account. When prompted to choose a Clio account, you are given the option to Change the account name in Zapier. This name is meant to help you identify the accounts that you connect Zapier to. You'll also want to select the region of Clio you normally use. 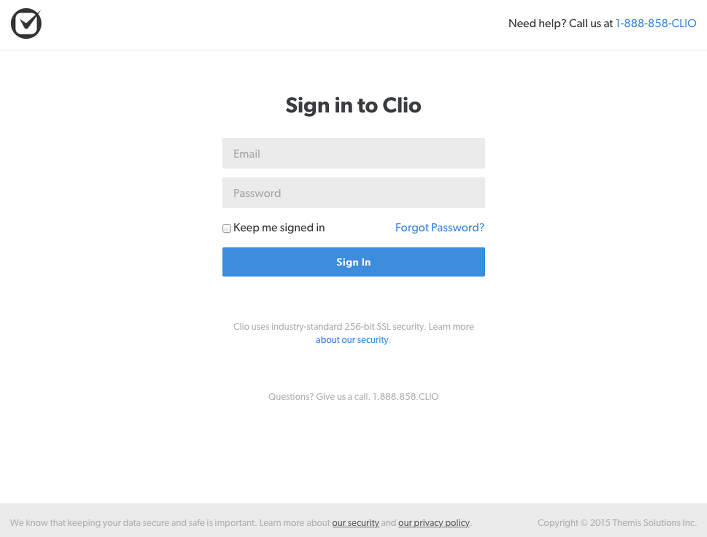 Select https://app.goclio.com if you normally sign in to https://app.goclio.com (most users), or select https://app.goclio.eu if you normally sign in at https://app.goclio.eu. Next, you will have to log in with your Clio email and password if you are not already logged in to Clio. 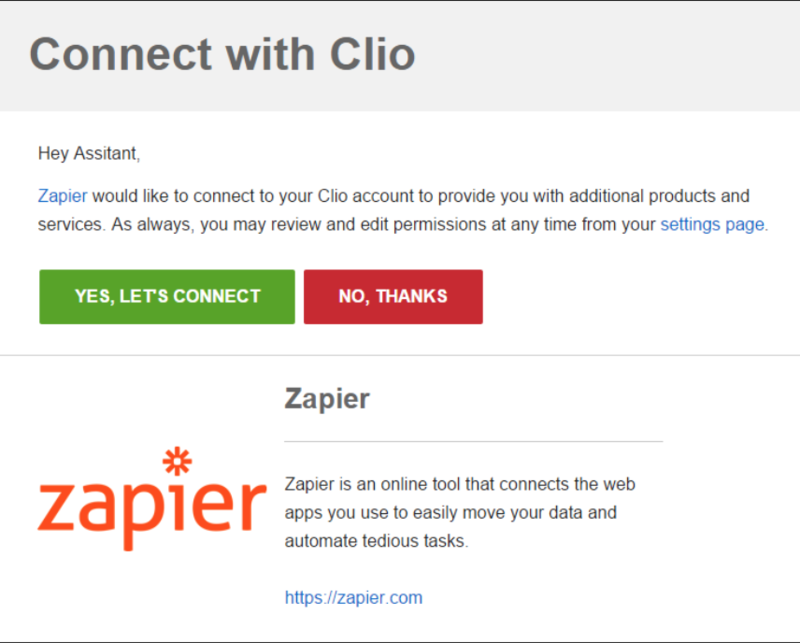 Once logged in, you will be prompted to connect Clio with Zapier. Click “Yes, let’s connect” to authorize the connection. Zapier will now be connected to your Clio account and you can continue creating your Zap. Chances are you are trying to retrieve "secure messages" which are never viewable outside of the Clio interface. Zapier cannot trigger on or work with secure messages at this time. This happens for users that connected their Clio account to Zapier a long time ago. 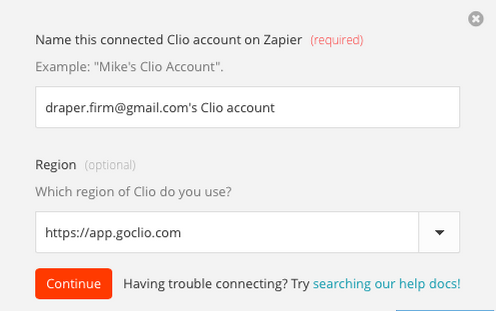 To fix, reconnect the Clio account at https://zapier.com/app/settings/authorizations, or create a brand new connection.